The #FifthModeofTransportation is Called #Hyperloop. Hyperloop. It’s a bird, it’s a plane, it’s a “fifthmode of transportation” developed by Tesla Motors’ Elon Musk and his teams at Tesla Motors and SpaceX. What is this open-source wonder? Why call #Hyperloop “fifthmode”? “We have planes, trains, automobiles and boats,” Musk said in 2012. “What if there was a fifth mode?” [ of transportation ]. As Motherboard described it, “Musk’s grand vision for a brand new, supersonic mode of transportation that could zip you from Los Angeles to San Francisco in a half hour. At 380 miles apart, that’s a speed of 1,200 miles per hour—twice as fast as a commercial airplane.” Sounds like some real Buck Rogers stuff. 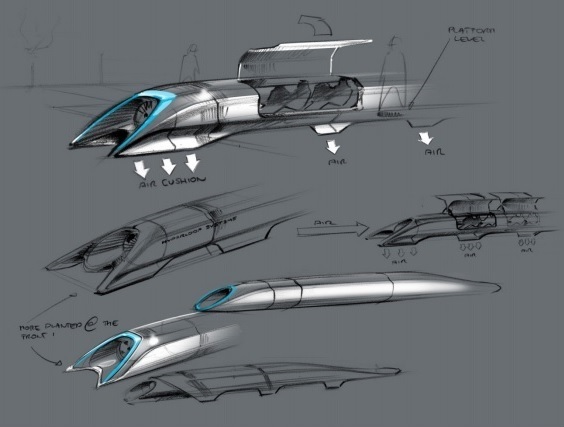 Tesla Motors /SpaceX honcho Elon Musk unveiled the Hyperloop alpha design document. A System of Tubes and Pods. At its simplest, Fifthmode Hyperloop is a system of two tubes in tandem, each tube enclosing people-carrying pods traveling in opposite directions. A Low-pressure System. Rather than utilizing a near-vacuum, the system would operate at a low pressure. There would still be a “non-trivial amount of air” in the tube. This air could be of varying density along the length of the tubes due to various factors including small leaks due to design penetrations into the tubes for purposes of entry/exit of the people-carrying pods. Sustainably Self-Powering. Per the design document, “by placing solar panels on top of the tube, the Hyperloop can generate far in excess of the energy needed to operate.” The self-powering #Hyperloop. Resistant to Earthquakes. The system would be above-ground, built on pylons. The pylons would include 3-axis dampers to allow for movement of the tube. Non-disruptive to Those Along the Route. A large portion of the proposed route would follow the existing right-of-way of California’s I-5 between L.A. and San Francisco. All this from the #FifthModeofTransportation. Teleportation – “which of course would be awesome”. A Vacuum Tunnel. The air pressure inside of the tubes would be “about 1/6 the pressure of the atmosphere on Mars” [ 100 Pascals, or about 0.015 psi ]. In other words the aerodynamic drag would be the same experienced when flying above 150,000 feet. Supersonic. Cruising speed of the pods would be about 700 mph / 1,130 kph, or about 0.91 Mach. Magnetic Levitation. Although the pod would be accelerated by use of a linear induction motor – which again, is NOT magnetic levitation, the pod would be supported by an air bearing formed from the ambient atmosphere inside the tube. A Long-Haul Solution. According to the design document, for trips such as L.A. to New York “the economics would probably favor a supersonic plane”. Per the document, Hyperloop is an “open design concept, similar to Linux. Feedback is desired from the community that can help advance the Hyperloop design and bring it from concept to reality.” The design team welcomes feedback at: hyperloop < at > spacex.com hyperloop < at > teslamotors.com Unless otherwise noted, verbiage within quotes is from the design document.